Maybe I was both hungry and thinking of photography, but a week or so ago, I found myself lingering over an online slideshow of photographs featured in the New York Times’ weekly food section. 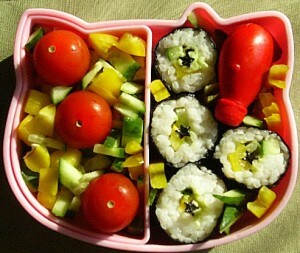 The colorful and compelling pictures illustrated an article about the growing popularity of homemade bento boxes. More and more Americans, it turns out, are getting creative and making their own versions of the traditional, compartmentalized, and carefully arranged lunches that have long been popular in Japan. The photos featured cute meals and some eye-popping displays of foodstuffs. Some were designed to cajole kids into eating foods they’d normally be wary of. Others were meant to visually lure adults with artfully crafted lunches that serve other purposes as well, like using up leftovers or enforcing portion control. The relentlessly cheery pictures reminded me think about how our desire for food is shaped and manipulated by the various ways food is propped, styled and photographed. That’s why we invited Lauren Shakely—publisher of Clarkson Potter, which specializes in lavishly illustrated and best selling cookbooks—to write a piece for click! photography changes everything and explore the subject. Spend some time sorting through food-related images from the Smithsonian National Museum of American History's Archive Center, for example, and you’ll come across a broad range of images that shed light on the ways food is represented on supermarket packaging, and in the media. The story is not always a pretty one. "I always say my job is to get the customer to buy the product just once, to make them feel like eating,” one food stylist was quoted as saying in a 2003 article in The Guardian. “If the food tastes revolting, then that's the manufacturer's problem.” And even if the food tastes good, there are still plenty of reasons for us to understand how the power of photography influences what we eat and, ultimately our health. Some schools and media watchdog groups are creating curriculum themes for kids alerting them to the ways photography whet their appetites and can lead them astray. To see one vivid example of that, watch a less-than-slick but revelatory short video on YouTube that juxtaposes micro-managed studio shots of fast food with grimmer snapshots of the real stuff, just after it’s been purchased. Bon Appétit? Buyer Beware? I guess that all depends on how hungry or photo-savvy you get.